Whether you’re a nameless Dark Lord looking to conquer the known world, a Champion of Light holding out against the forces of evil or a Northern barbarian facing claimants to a stolen throne, Dragon Rampant allows you to bring those battles to the tabletop. 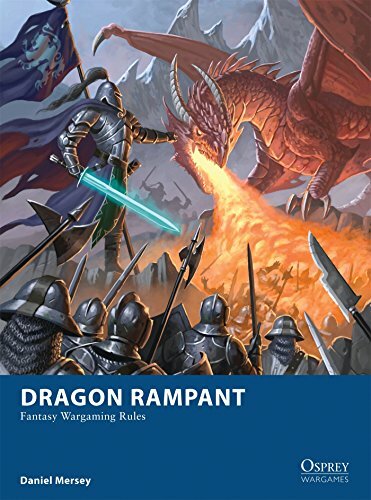 Developed from the popular Lion Rampant system, Dragon Rampant is a standalone wargame that recreates the great battles of Fantasy fiction. Scenarios, army lists, and full rules for magic and monsters give players the opportunity to command unruly orc warbands, raise armies of the undead, campaign across an antediluvian world as the warchief of a barbarian tribe, or exploit the power of mighty creatures and extraordinary sorcery. An army usually consists of 6-8 units comprised of 6-12 individually based figures. These small units move and fight independently, assuming that they follow your orders rather than just doing their own thing. Command and control is just as important on the battlefield as the power of a troll chieftain or the magic of an archmage.